If you need an argument for participating, (when two regattas so close to each other is insufficient on it's own) we wish to share with you three good reasons that will surely convince you to come and join us before storing your boat away for the winter. First: Proximity and quality - In that same week, you will be able to participate in two regattas before the winter break, less than 100km apart, on two sites well known to A-Cat competitors and offering ideal conditions for maximizing pleasure both on and off the water. Both sailing clubs offer a warm welcome, easy launching, sandy beach, freshwater, nice tactical playground with mostly flat water conditions and this will allow everyone to play out their favorite game with pleasure or performance and most often a mix of both. 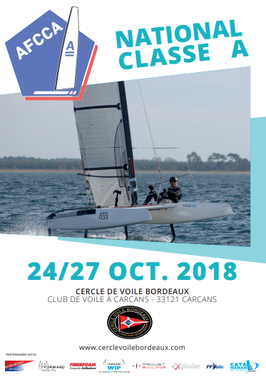 Second: A large and mixed fleet - Last year, the French Nationals attracted 49 competitors, including 15 foreigners, and resulted in an ideal balance between Open and Classic divisions. No doubt this figure will be greatly exceeded this year, counting on the “Cercle de la voile de Bordeaux” expertise in organising a great and fair regatta that will make this 2018 Nationals a further success. Moreover, this 2018 edition will not be combined with the traditional Grand Prix de l'Armistice, which means that the whole lake will be ours! Regarding Cazaux, the “Régates de printemps”, which we first experienced last year, saw 18 competitors sailing in exceptional weather conditions. Here too, this figure should be greatly exceeded for this Autumn regatta, with the ongoing ambition to gather both Open and Classic divisions at the same event. Third: Friendliness and celebrations ashore - The French 'A' cat National is not only the opportunity to race, to tune your boat or to attend the AFCCA general assembly; it is before all the opportunity to meet enthusiasts of the class around several events that should appeal to all sailors. 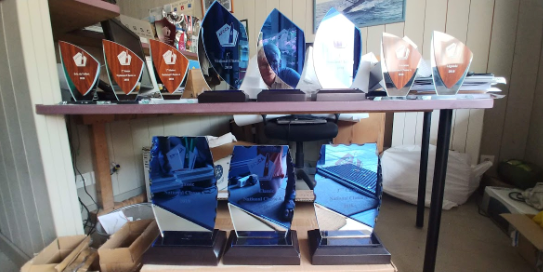 We can not reveal the whole program yet, but it is planned that on Monday 22nd and Tuesday 23rd, between the two competitions, an extra special 'A' Cat program will be available either on the water or ashore. A welcome drink, a sailors diner, opportunities for technical and tactical talks, collective training, ... and many other ideas are being prepared. The 'A' Cat is above all spending good moments with friends, making racing even more interesting and fun ! Trophies and other prizes are waiting for you! Who’s up for it?